Classic macaroni salad is a creamy and delicious pasta salad side dish perfect for parties, picnics and pot lucks. Mayo and honey mustard combined with sweet and tangy relish and boiled eggs, makes every bite a perfect pairing for your outdoor grilling menu. There is a reason it was on grandma’s table every holiday! If you are looking for an easy no fuss classic macaroni salad, this fits the bill. 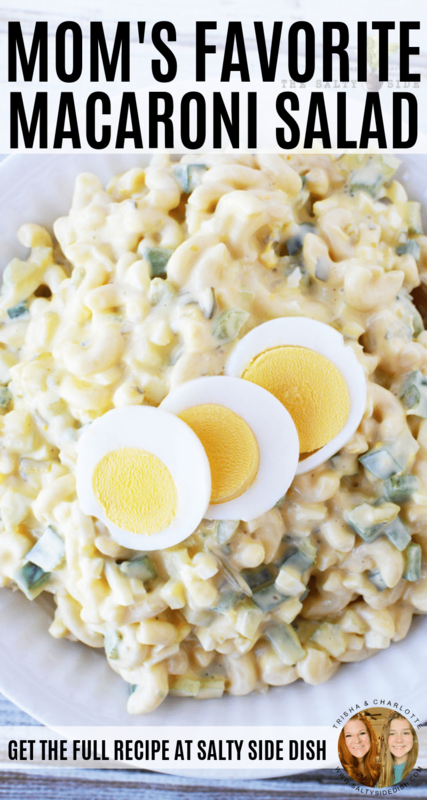 With the right amount of crunch in every bite, but still the sweet tangy taste of honey mustard, this is a creamy macaroni salad just like grandma used to make. You know you cannot say summer without side dishes!! And why would you want to? Its not like winter calls to you to sit outside with a bowl of food, you know? Kick off your next get together with this delicious classic pasta salad dish that fills you up and dances on your tongue. Perfect for picnics, parties, and holiday functions, pretty much every mom in sight has a recipe that she loves the most. Personally I like to mix the table up with other known favorites like Carrot Salad, Pea Salad, and Ranch Pasta Salad, but its also fun to add some unique newbie recipes like Quinoa Black Bean Salad or Southwest CousCous Salad as well. 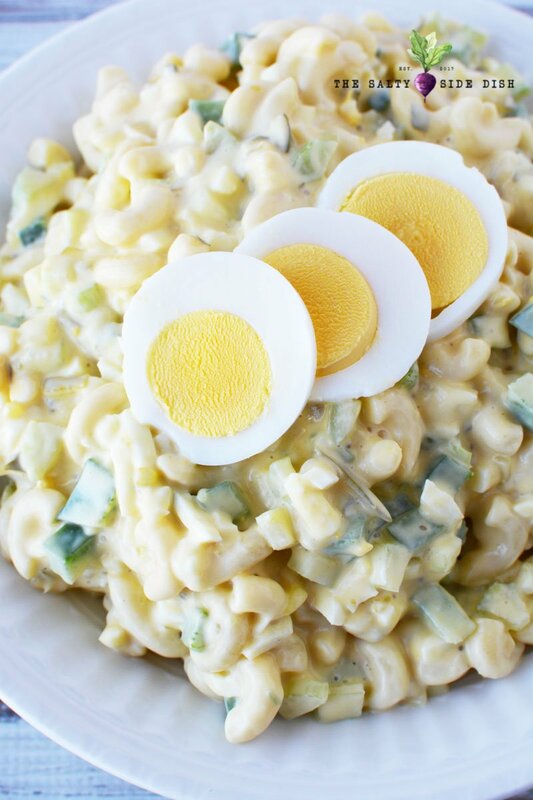 Macaroni Salad with egg is the only way to eat and enjoy it. 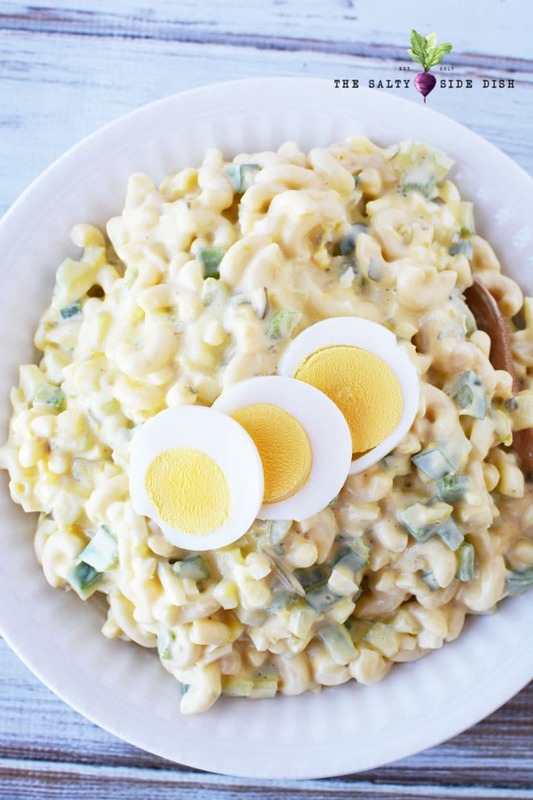 The classic flavors of hard boiled eggs, elbow macaronis, and a mixture of crunchy peppers, onions combined with sweet relish is the side dish of your childhood. 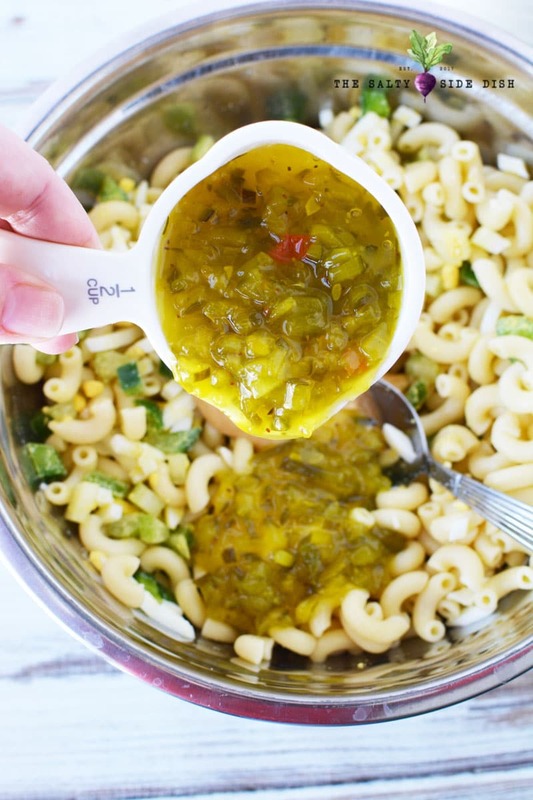 This has the classic pasta salad flavor I recall from years ago! 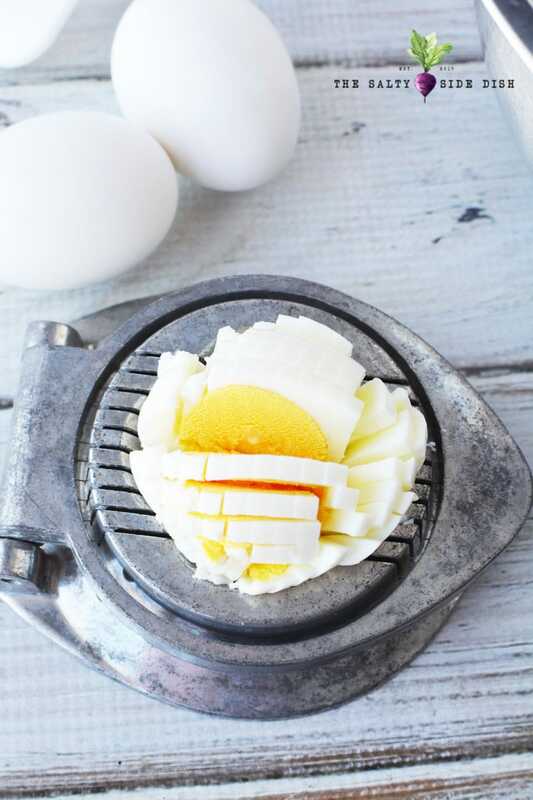 Dicing Egg Tip: To dice my egg, I put in an egg slicer and then turn it and put it in the opposite way. Cook pasta according to package directions. Rise and drain. Let cool. If you prep and mix while your pasta is hot, it will melt and make your dressing portion runny and kinda gross. You can make your pasta ahead of time if you want. Dice 3 hard boiled eggs (I use an egg slicer to dice eggs so they are proportioned well for eating) and add them to a mixing bowl with green pepper, celery, onion, relish and honey mustard. Note on Mustard’s: In this case I used a honey mustard and there really are a ton of kinds. I think we all have a brand favorite and all taste slightly different, so make sure you choose your family favorite! Making the best macaroni salad often comes down to a chef’s personal choice. Stir in pasta so all your dry ingredients are well mixed up. Add mayonnaise (I prefer Hellmann’s) milk and sugar and mix well. You can also premix these together in a separate bowl and then combine if you prefer. Refrigerate, covered, for at least four hours. Top with remaining sliced hard boiled egg before serving for a beautiful presentation. 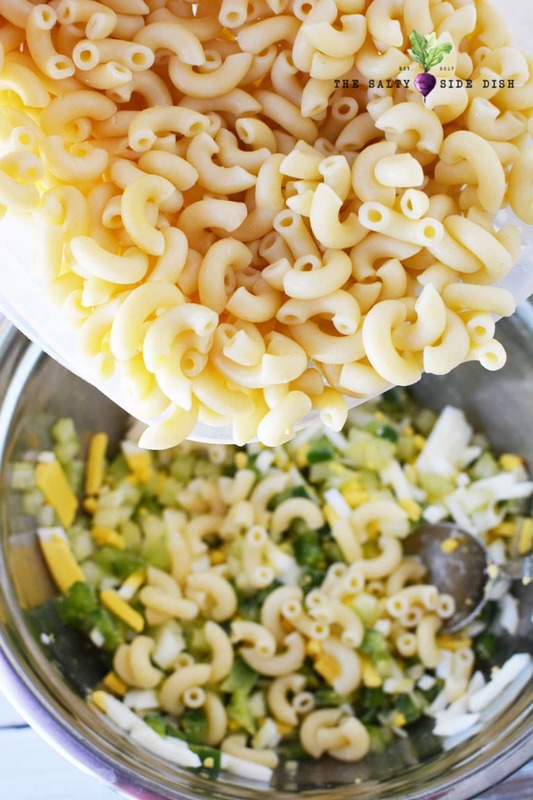 You can really alter how macaroni salad tastes with changing up what you put into it! 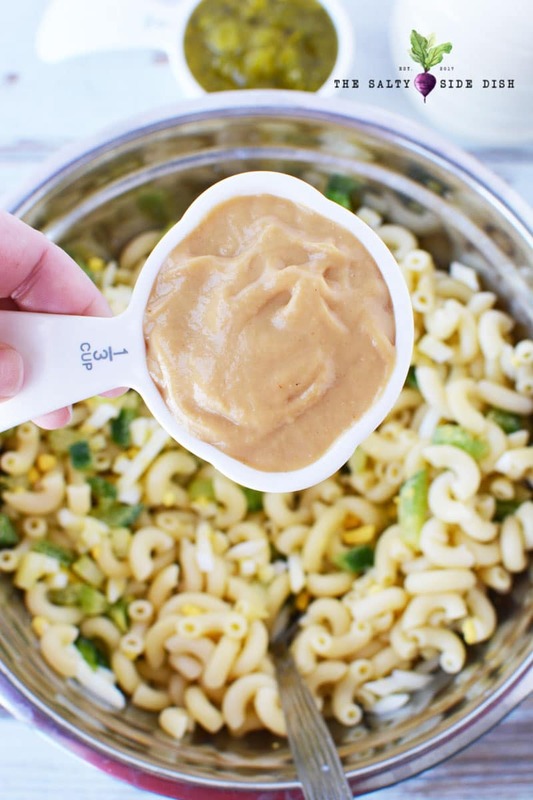 The tangy dressing goes well with a lot of things and here are a few extras you can add to your macaroni salad dish to mix it up and make it the way you love it. If you want to keep it classic like we did above, onions and sweet relish fits the bill on making the most of your macaroni salads, but depending on who you ask, there are so many other ways to re-create. How long does Macaroni Salad Last? Macaroni salad is one of those side dishes that does well when left in the fridge to marinate a bit…but too long and it goes the opposite way. Personally I am a 3 days and done before I dump my food. I don’t like to remix sauces to take away the dryness and in some wet ingredient recipes, the sauce can even get soupy. As always seal your food properly to give it the best ability to stay fresh, and I love these food containers for that. 3 days, people, 3 days. What side dish goes with Macaroni Salad? Need potluck and party side dishes for crowds? Dang, there is so much good stuff to fill up on. I don’t know why summer is swimsuit weather cause its when I eat the most! 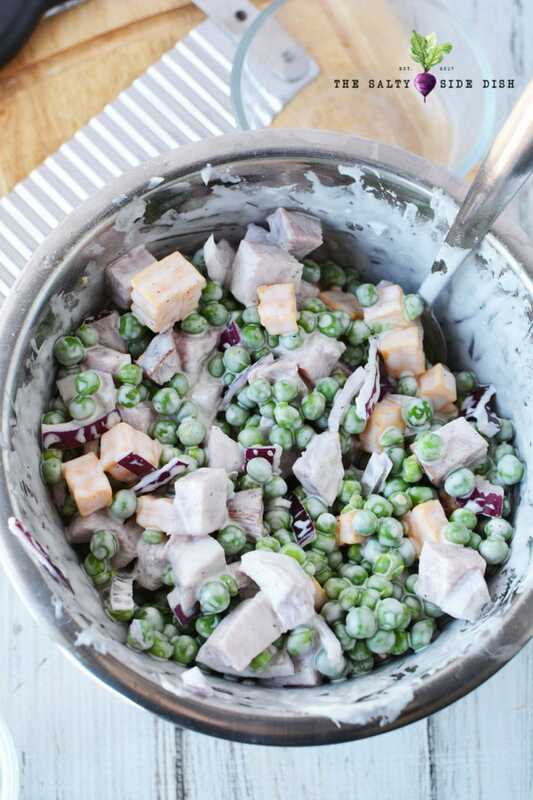 Ham and Pea salad makes a great pot luck love as well as a sweet side like Fruit Salad Fluff. And if you need a main dish, pulled pork, honey chicken, and pretty much anything on a grill pairs well with classics like macaroni salad. Since someone always, always messages me and asks, the truth is only you can decide what is right for your diet. If you are on a carb free, low carb or Keto diet, this is probably not your recipe as its…pasta. But for most people a little pasta on the side is just fine. Around here there is no wrong way to make a macaroni salad, just a favorite way. If you are looking for a different type of recipe, make sure you check out the recipes for these salads and see if they are what you need. I love them all! Old Fashioned Macaroni Salad – Wrapped up in delicious spices and mayo, the pasta in the macaroni salad is so creamy and delicious. It makes me happy when you come back and let me know what you love and what you altered. You can find me here, on my Pinterest, Instagram, or TikTok (@TrishaMayHaas) or tag me by using #SaltySideDish to show me your bowl. I am classic myself in that I like to print my recipes and bring them to the store and sit in the kitchen while making. Here is as simplified printable recipe card for you to take with you while you cook. 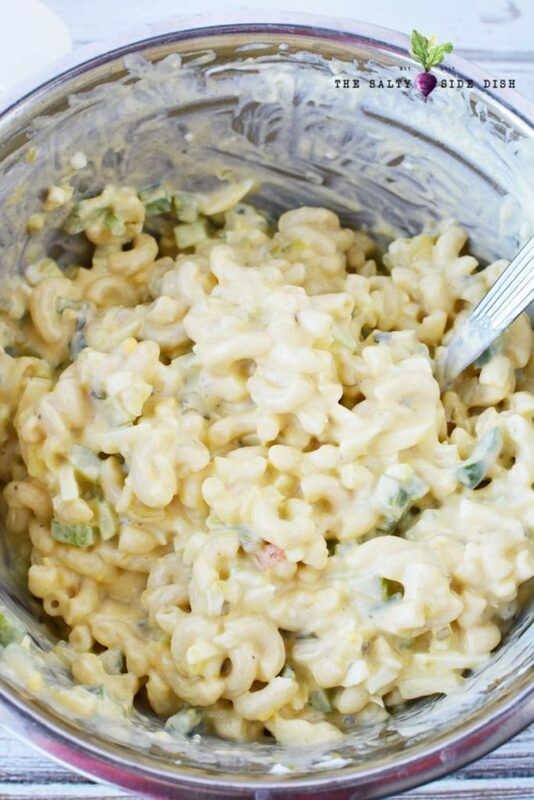 Classic macaroni salad is a creamy and delicious pasta salad side dish perfect for parties, picnics and pot lucks. Mayo and honey mustard combined with sweet and tangy relish and boiled eggs, makes every bite a perfect pairing for your outdoor grilling menu. There is a reason it was on grandma's table every holiday! Cook pasta according to package directions. Rise and drain. Let cool. 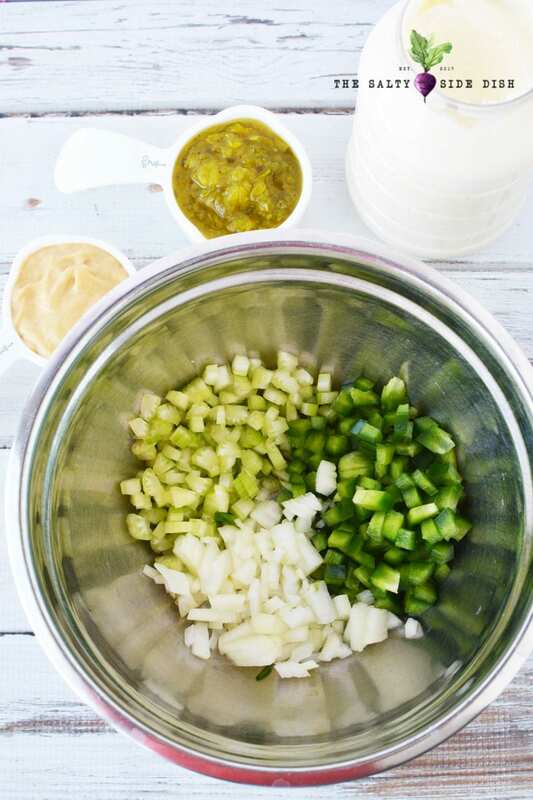 Dice 3 hard boiled eggs and add them to a mixing bowl with green pepper, celery, onion, relish and mustard. Mix well. Stir in pasta. Add mayonnaise, milk and sugar and mix well. Refrigerate, covered, for four hours. Mix well before serving. Top with remaining sliced hard boiled egg before serving.